Remodel of 1926 Spanish kitchen and laundry rooms "AFTER"
The owners of this charming Spanish home built in 1926 asked me to help them update the kitchen and laundry room and incorporate some elements of Spanish architecture. During the space planning phase we studied several layouts. Some kept the laundry room in the same location, but others moved it out. The latter concept was chosen. The laundry was moved upstairs to a hall closet. This allowed us to capture the space for the kitchen. The cooking components could now be brought closer together to make it a better functioning layout on the south half of the room. The sink remained under the main window; the new induction cooktop is to the right of the sink with a new stainless steel hood above. Across from the cooktop is the staircase to the 2nd floor. We utilized the space under the stair landing for more storage. The recessed cabinets have roll out shelves for full access. The cabinets are topped with a 12” deep quartz countertop. Decorative shelves with wrought iron brackets provide a place for cookbooks and a colorful display. 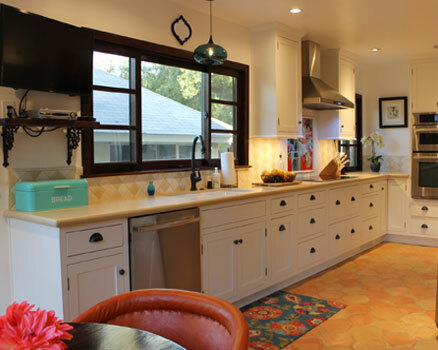 White Shaker cabinets provide a light, bright and timeless back drop for the expanded kitchen. The Caesarstone countertops are accented by a back splash of 3” square tiles in white, cream and sand colors. The white tiles surround the colorful mural of flowers below the hood, and continue up to the celling. The white tiles blend horizontally into the other colors and flows across the countertop areas. The floor is surfaced with classic Sausalito pavers. The threshold is surfaced with 4” decorative Spanish tiles, adding a great visual accent between the kitchen and dining room. The doorway to the dining room was enlarged and a pair of ornate carved doors adds a welcoming frame both rooms. On the north end of the kitchen, a hutch was created along the wall to house wine, glasses and other serving pieces. A breakfast area is created using leather barrel chairs and a round table with an iron base. New recessed LED lights create a background of light that is accented by the turquoise glass pendants. The pop of colors: turquoise, orange, red and yellow compliments the neutral background in this casual Spanish kitchen.